For the town in Burundi, see Kigoma, Burundi. Kigoma is one of the busiest ports on north eastern Lake Tanganyika, since historically it was the only one that had a functioning railway connection (the one at Kalemie in The Democratic Republic of the Congo is not operational at the moment), a direct link to the ocean port at Dar es Salaam. Kigoma Port in the Kigoma Bay has a wharf of two hundred metres and several cranes and is equipped to handle shipping containers. However, the bay is suffering from silting up as a result of soil erosion from surrounding hills, and the water depths at wharfside has diminished from 6 m to 1.8 m. This may threaten the economic growth of the port. In May 2007 the Tanzanian Government announced a plan to create an economic zone at the port to stimulate trade and to ensure stable economic growth of the Port for the government in Power in 2015 and 2020. The MV Liemba sails every week from Kigoma to Mpulungu in Zambia at the southern tip of Lake Tanganyika, stopping at a number of other lakeside towns in Tanzania on the way. The MV Mwongozo sails from Kigoma to Baraka, Uvira and Bujumbura at the northern tip of the lake. Current road connections to and from Kigoma are improving. However travelers should be advised to take extra precautions when travelling. A gravel road links the town northeast to the national road network, and earth tracks link north to Burundi and southeast to Sumbawanga. 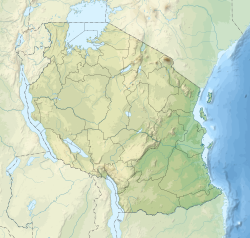 The Central Line of the Tanzania Railways Corporation runs from Kigoma to the Port of Dar es Salaam on to the Indian Ocean coast via Tabora and Dodoma. 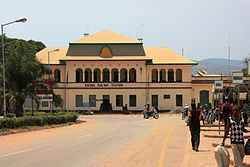 It was completed in 1915 when Kigoma was part of German East Africa. In Tabora, there is a connection to Mwanza on Lake Victoria, with ferry connections to other Tanzanian lake shore places, and formerly Uganda. At Tabora you can also travel by train to Mpanda. For a time in early 2010, the line was closed but service has apparently been restored. ^ Tanzania Railways Corporation: Kigoma Port. Retrieved 30 May 2007. ^ Daily News, Tanzania: "500m/- set for Kigoma economic zone." Archived 2007-08-31 at the Wayback Machine Monday, May 28, 2007. Retrieved 31 May 2007. 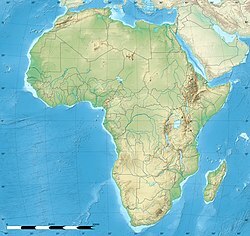 ^ Michelin Motoring and Tourist Map (2000): "No 955 Africa Central and South". Michelin, Paris. ^ "Weatherbase: Historical Weather for Kigoma, Tanzania". Weatherbase. 2011. Retrieved on November 24, 2011. Wikimedia Commons has media related to Kigoma. Wikivoyage has a travel guide for Kigoma. This Kigoma Region location article is a stub. You can help Wikipedia by expanding it. This page was last edited on 17 January 2019, at 00:32 (UTC).